“They deserve recognition,” Christiane Fladt begins her book, the first in-depth attempt to highlight the lives of high-altitude porters from the Shimshal region of Hunza, Gilgit-Baltistan. 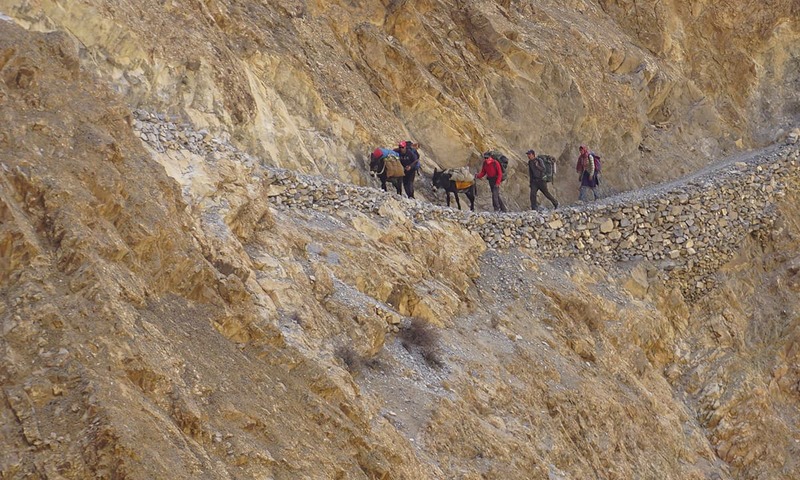 The volume aims to present a “complete picture of Shimshali ambitions and achievements” and, as her narrative suggests, these porters and their accomplishments have received little recognition or reward. These men live a life of constant peril. The book – bold, necessary and informative – opens with a crisp introduction which gets straight to the point. No funny anecdotes, no whimsical descriptions of the subjects and no flowery quotes on mountain climbing. In a nod to its author’s place of origin, it is written in a true matter-of-fact German manner. For someone whose lived experience is far removed from that of the porters, in terms of gender, language, nationality, religion and probably much more, Fladt has written a remarkably well-informed book. The information has been painstakingly gathered through extensive interviews over the course of several years, making her work a unique addition to the minimal literature available on Pakistani high-altitude to date. The book taps into the mountain tourism narrative of Pakistan through untold stories and paints a vivid portrait of several legendary Shimshali porters in its individual chapters. These include Rajab Shah, Meherban Shah, Aziz Baig and a number of other notable climbers. Each chapter differs in tone as Fladt lets the protagonists lead the readers through detailed accounts of both their successes and their losses. She also explains at length the method of selecting the porters for inclusion in the book: only those who have climbed above 8,000 metres have been covered in detail. The author, however, has made mention of a few others as well, like Tafat Shah, one of the pioneers of the profession in the Shimshal region. Guided by a writing style that is straightforward yet engaging, Fladt relates the tales of each porter, tying the narrative together using various themes related to mountain tourism in Pakistan. Most of those interviewed do not climb for glory or a sense of adventure, but out of necessity. Lack of economic opportunities in their remote valley offers few other livelihood options. Many continue climbing well into old age, in order to provide for their families. One critical problem common among older porters is memory loss, the author finds. Mohammad Ullah’s climb of Gasherbrum-1, one of the most difficult mountains to climb in Pakistan, has “faded in his memory”. Nor can Qurban Mohammad recall the precise years of his various rescue missions to Nanga Parbat and Broad Peak. Many other porters have similar gaps in their memory. This loss is made especially poignant for Rajab Shah and Meherban Shah, who both lost sons to traumatic deaths on the mountains. It is, indeed, problematic that the history of local mountaineering is being slowly erased with their fading memories. Fladt’s account ensures that at least some of it is saved from permanent loss. The book’s most exciting parts present the almost conflicting perspectives of different porters on the same climbs. “It is intriguing to compare how one and the same event is recorded by two different characters,” says Fladt, while commenting on some of the noteworthy differences. It is interesting how she reconciles these differences, even taking up the monumental task of putting together the story of Pakistan’s first-ever bid to climb the world’s tallest mountain, Everest, a failure recalled differently by the different people involved in the adventure. But such is the nature of oral history and memory — they are moulded by the life and time of each narrator. To her credit, the author has painstakingly provided cross references while handling conflicting accounts. Her own critical voice is audible throughout the book. Some of the stories that appear improbable are followed up and contextualised. Not much is accepted at face value — something that is thoroughly refreshing. She pulls no punches while making comments, yet she leaves it up to readers to decide which story they deem probable and which they do not.